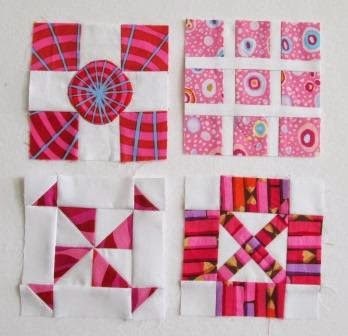 I have four more Pink Dear Jane blocks done. I have been making my Dear Jane with the Kaffe Fassett Collection. I just love the pink Pencil fabric, it is kind of a stripe but is not but it adds movement. I also did B-4 in the blue, it is called Chris's soccer field. I was just at my son's soccer game Friday night, but his name is not Chris. I am apart of Jane Stickle face book group and the feature block was B-4 this week. I must ask, Do you see this as Black and Blue or is it Gold and White? I think next week is B-5 that I have done already in purple. That might be the the March colour? Maybe. I had done some tulip tops but then did not get the leave and stem done. Well, this week I completed them. 12 pretty little pink tulips. I kept going and got the Blue tulips done too. There happens to be 14 blue ones. I have added this post to the Rainbow Scrap Challenge 2015 Socrappy's link page. I am taking the Puppy Gemma to her first fun trial. Wish me luck, she maybe wild today. Edit up date - Gemma did great, so much fun! but on the way home I was rear ended. Van has a boo boo, fixable and we are not hurt. So pretty. I love your Tulips. So colorful and perfect! Those are very pretty tulips; will you be making 12 of each colour? I'm interested to see what you do with them all. Have fun eat the trial. I'm having to type around my Chihuahua's head at the moment (the laptop is literally in my lap and she's right slap up against me in the chair!). 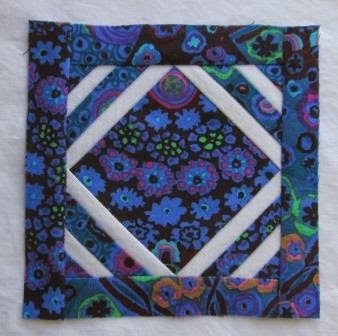 Bravo for tackling the Dear Jane blocks in ANY color! Your tulips are delightful. Ours will be blooming soon in our unnaturally early spring weather. Love the tulip blocks. You've a lot of patience to be working the Dear Jane quilt. Are you piecing by hand? Your soccer block is blue and black, and a bunch of other colors mixed in. Love your Tulips. I think the next color is yellow - did you notice Angela's background color was yellow today. Good luck to you and Gemma, I saw gold and white in the dress. Love your tulips. Won't they look great in yellow for March? Great blocks! I keep watching the Dear Jane + Kaffe blocks with envy! Hope Gemma did well today! Wow, you've got so many blocks done. I really like the Kaffe Fasset Dear Jane blocks. LOVE those tulips!!! Your Dear Jane blocks are gorgeous too. Keep up the good work. LOVE the tulips blocks. Dear Jane is wonderful too. Great work. 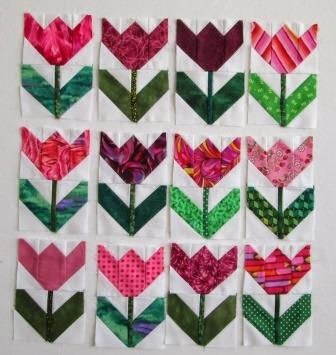 Beautiful tulip blocks! Sorry about the accident, glad that no one was hurt. Makes for a rough weekend though. 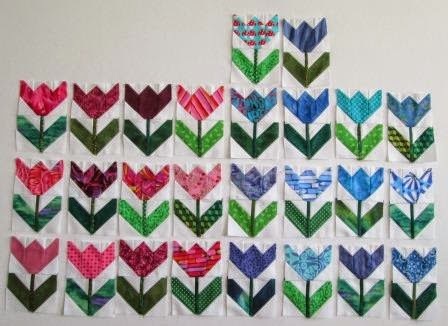 Wonderful tulip blocks! Love your KF blocks. Sorry to hear about your van but am glad to hear that no one was hurt.